The Radical and Brilliant Edge Fund! Round 2 of Edge funding came to a close 20 July during a meeting where 37 people came together to distribute £30,000 between 15 groups. Participants included applicants, Edge members and recipients of small grants from this round. We met at the Stockwell Community Centre, which has a lovely hall with glass doors opening onto a courtyard garden. As is often the way on a Saturday morning, people arrived slowly from 10.30 onwards and the day started later than the 11.00 start we hoped for. After brief introductions and agreeing groundrules our facilitator started the day with an exercise which aimed to identify who’s in the room so that everyone can understand the different backgrounds, cultures, beliefs and other factors which they may need to take into account during the day. It also aims to highlight what people have in common as well as celebrating our differences. The exercise had a mixed response, some welcomed the opportunity to learn about each other as individuals and others found it uncomfortable or questioned its relevance. We then shared a little of the feedback on applications from assessments submitted before the meeting. We explained that after lunch we would be breaking into Group A and Group B; applicants in Group A would set up a ‘stall’ for their group while Group B and Edge members would visit the stalls to find out more about their work and their application. Then they’d swap. Lunch was an opportunity to talk to those in the same Group as you, who you would not otherwise get a chance to speak with. An amazing spread of Indian food was served by one of our members who had got up at 5am that morning to prepare it, accompanied by an Iraqi dish from another member – it was delicious and very much appreciated! As last time, the stalls brought the room to life with passionate discussions about issues facing communities in the UK. Groups unable to attend on the day joined us via phone or Skype. In the garden, groups of people huddled around laptops and mobile phones on loud speaker, finding shade under the trees. It was difficult to bring the discussions to an end, with a clear sense that people could have spent all day making new connections and learning about each other’s work. Once Group A and B swapped around, we came back together in a circle. Our voting systems are still evolving, and after some discussion about the voting system for this round it was decided that 30 chickpeas should be given to each member and each applicant group to distribute between the 15 groups. The maximum number of chickpeas you could allocate to one group was 5 and you could not vote for yourself. These votes were then combined with the scores submitted prior to the meeting (any duplicate scores were removed). Each group was allocated £1,500 as a minimum, and the 5 groups receiving the highest scores were given an additional £1,500, bringing their total to £3,000. The day finished with a go-round, where each person shared their thoughts about the day to the group. The comments were more outspoken than last time and sometimes quite critical, but what was reassuring was that people seemed to understand and appreciate that we are still very much in our early stages – learning and evolving as we go. Several people from applicant groups have now also joined us as members, which we are always very happy about! There were a few things we wanted to correct from the Round 1 meeting. Firstly, we wanted a more diverse group of people. The group was much more diverse than last time, mostly because more groups run by and for communities facing injustice applied and were short-listed in this round. However, as pointed out by a member in the online survey, representatives from Edge Fund were “still mostly white, middle class”. This should continue to improve over time, so long as we can be aware of, and respond to, the factors that affect who joins us. Applicants who took part in the last meeting said they wanted to know more about the groups ahead of time, so we sent out all the applications three weeks before the meeting to both applicants and Edge members. We also gave people more information about what would happen on the day, including referring people to the notes on the previous meeting on our website. We also asked people about people’s requirements in good time, including any cost reimbursements needed. The scoring system changed from Round 1. In the last round, as it turned out, the highest grant was only £500 more than the lowest and people commented that this didn’t seem right considering the amount of time spent on assessing and scoring. Before the meeting we had agreed a system which translated the scores into a percentage of the amount requested in the application. However, this was quite a complex calculation and we felt it was important everyone understood how the grants were worked out. Therefore, this time we proposed that each group receive a minimum of £1,500, with the top 5 scored applications receiving an additional £1,500. People seemed to much prefer this system than the one used at the last meeting. The venue we chose last time was not as accessible as it could have been in terms of central location, public transport options and proximity to the nearest station. This time we chose the Stockwell Community Centre, which is just around the back of the Stockwell tube station, which is well serviced by the Victoria line and several buses. The Stockwell Community Centre also has wi-fi, allowing people to join us via Skype (although the signal was not reliable inside). We ensured cups and plates were provided this time, instead of asking people to bring them along. Again, one of our members cooked lunch. One major point from the last meeting was that there wasn’t enough time to talk with each applicant on a one-to-one or small group basis. Sharing applications ahead of time was an attempt to ensure that time spent at the meeting was more meaningful as people would already know who all the groups are. However, people again said that they would have liked more time to talk to other groups, particularly the few who did not have time to read the applications beforehand, and some felt uncomfortable making a judgement with the amount of information they had. Many people suggested that the day start with presentations, which we have been reluctant to do before now since it can be very intimidating to present to a large group, but we will need to reconsider this. Whilst we had done our best to ensure all groups were able to participate in the day, including letting people know the date two months in advance and covering travel costs, four groups were not able to be with us in person. One of the groups could not even join us remotely and we noted that this affected their score; the scores they received based on their written application before the meeting were higher than the scores submitted on the day. We need to get the balance right between asking people to be part of a decision-making process, which requires some critical thinking about other groups and their work, and trying to build community and connections as individuals. The two aims seem to be slightly at odds with each other. In this meeting, many people felt strongly the focus should be about the groups, not who we are as people, whereas others wanted to make more personal connections. It seemed this time that people felt less able to participate compared to last time. This may be a reflection of the greater diversity in the room or perhaps the style of facilitation. Also, last time we paired applicants up with members well ahead of the meeting so they had a main contact person and support to complete the full application. This time we made this optional, so that groups were only paired up if requested. Only one group asked for support from a member and this may have had an impact on how comfortable people felt when they arrived. That said, the comments at the end suggested people were comfortable enough to air some of their honest thoughts. As a fund with limited resources and many applicants, it is difficult to overcome the sense of competition. This was uncomfortable for some people on the day. There is no obvious solution to this as we will never have enough funds for everyone, but we are exploring other ways of helping groups so that more applicants can benefit from the process even if they don’t receive funding. We’re very lucky that everyone who took part gave us honest and useful feedback on the day and we’ve already got a clear idea on how the next meeting should be structured. We’re also gathering further feedback ahead of our next members’ meeting to help us address some of these issues. Considering this is a work in progress the day went outstandingly well. The intent and the heart of Edge Fund is very clear. Everything is done with sensitivity. It was a positive experience. We repeated some of the same mistakes as last time. We ended up discussing how to use the scores again. There are always drawbacks whatever you choose to do, it’s hard to please everyone. It would be great if everyone could take responsibility for moving Edge forward. I would like for everyone to be able to speak for a few minutes to the group as I was not able to meet everyone. I enjoyed the morning’s exercise. I want to know who the people are behind the organisations otherwise I don’t feel connected. Hiding behind an organisation can be a way of distancing ourselves and that defeats the object of Edge Fund. I agree with the comments about the short presentations and stalls. We should have one voting system at a time. I enjoyed meeting people today. The morning exercise didn’t work. Each group should have had 2-3 minutes at the beginning to present to everyone. We stumbled a bit at the voting stage and shouldn’t try to change the system on the day. Small groups worked really well. The afternoon was much better. I enjoyed every moment. I learned a lot from the morning session, it helps you to know who you’re talking to. I didn’t like the morning exercise. People need time to recover from emotional experiences like that. I liked the morning, it helped to build trust and allowed us to get to know each other. It was quite moving. I liked the morning too. I will use it with my group. I felt comfortable talking about my experiences. I liked the voting with chickpeas. I am always so impressed by the people I meet through Edge. I wonder, does it take too much time to come along to a day like this? I hope you will join us as members. Regarding the morning, I am not against inner work but it should be a distinct exercise for Edge as a radical organisation. The morning was good. The projects this time were even better than last time and the voting system was better too. The afternoon was flawed because you couldn’t talk to everyone. We need to have presentations. The day was very positive on the whole. The beginning was helpful, as people arrived divided but it made people see what they had in common with others. But the questions need to be carefully considered. It feels like Edge is moving in the right direction. It’s great to be able to talk about more controversial stuff and to celebrate ‘edginess’! The food was delicious. Perhaps groups could make posters next time, to communicate about their work. I was pleased with the outcome of the scoring, I can see why the top 5 were in the top 5. I would like to give thanks, Edge is fantastic and refreshing. It is brilliant what Edge is trying to do. The scoring process was enhanced by being here but it could have been better. The structure was poor. I made connections today that immediately justified my time being here. Edge is so young, it’s a wonderful process to be part of. I was not a massive fan of the morning, it went on for too long. There was not enough time for discussion and we needed more printed copies of applications. The £1,500/ £3,000 split worked really well. I agree we need short presentations. I love meeting people in person at Edge meetings. I feel very energised. I like the process. It’s good to have an introductory exercise but it needs to be shorter. I have seen big companies run less effective meetings! Let’s remember – A lonely whisper, together we shout. Let’s support each other. This is just the start. The morning session was not necessary. In the application it didn’t ask about our identity. It’s about the organisation, not the individual. The funding process was very good. Very interesting to meet many people in the flesh who I had not met before. I was not happy about the first session. Individuals are not important, human rights are universal. So happy to see different groups together. Groups need the opportunity for shared experiences. It’s amazing that Edge exists. I also prefer to have presentations. Maybe people could bring pictures and photos? It is different hearing in person than reading an application. I didn’t like the morning exercise, it made me see our differences. The voting system was good. I met interesting people. I didn’t mind the morning – I quite liked it. But it needs to be shorter. I like the idea of posters. I would like to hear groups’ visions. What we are for, not just what we’re against. Should we score against set criteria? It was a beautiful day. Opportunity to meet people. I would definitely like to hear 5-10 minute presentations. I still want to know more, would be nice to listen more. Excited about how Edge can go further. For the morning exercise there should have been a section with questions relating to groups. I had a great day, feel reaffirmed. People were sensitive even when giving criticisms. Can people who like presentations support others who are less confident? We also need more help in the engine room of Edge. We should focus on groups not individuals, with more information at the beginning about the campaigns. We missed a trick; should have made time to find ways of helping each other. The voting system was better than last time. Edge is radical. Fantastic organisation. DPAC and Black Triangle condemn the misguided, insensitive and inflammatory comments of Dr Phil Peverley. We also want to condemn the pitch and severity of the pieces in the Mail and Telegraph (2nd August) framing Peverley’s comments, as a further outrageous abuse of the facts and issues affecting disabled people and those with diagnosed long term health issues. Peverley’s words are an insult to all those that suffer the misery and anxiety of Atos within the regime designed to remove support from disabled people. His words are an insult to those that have died shortly after being declared ‘fit for work’ or before an appeal which found that, once again, Atos were wrong-something that happens with increasing regularly in a system that is chaotic and unworkable. Those people may also have been within the so-called ‘proportion of punters’ that Peverley claims ‘are hell-bent on trying to prove they’re really ill, and need us [GPS] to confirm it’ or maybe they were some of the perceived ‘disgruntled unworking well’ who are ‘full of indignation at being considered reasonably healthy.’ The Department of Works and Pensions DWP own figures show deaths within 6 weeks of tests were at over 10,000. The DWP are refusing to publish up –to date statistics, so we would guess that these figures have risen significantly. Remarkably, Peverley declared that he considered putting a picture of Stephen Hawkings in his surgery with the caption: ‘This bloke is not on the sick!’ The comparison of Hawkings to every single disabled person is beyond bizarre. This is a man with the funds to ensure a network of P.A. support, home adaptations and technical aids- something far out of the reach of the majority of disabled people –where even a basic level of support is becoming increasingly unlikely in the current slash and burn climate. Hawkings won’t miss his ILF payments if the appeal hearing against the DWP doesn’t produce the correct verdict. Hawkings won’t need to worry about local authority cuts or the tsunami of other cuts, caps, punitive costs, sanctions and penalties being imposed on disabled people and other low income people by this Government. In Sept 2012 the BMA also said that GPs workloads had massively increased due to the chaotic system of the WCA and increasing numbers of appeals. Peverley also says: ‘’These fitness-to-work assessments – under Atos, and under anyone who takes the role for that matter – generate a massive amount of work in general practice’ in his column in the Pulse. However, neither the Mail nor the Telegraph wanted to pick up on the increased workloads the Atos/WCA system is causing for GPs. None wanted to mention that people can now be charged up to 200 pounds for GP reports, to support them in an assessment, or that GPs increasingly refuse to supply reports either.- a further hurdle for disabled people and those with debilitating long term health issues in the attempt to gain the support they need in the punitive assessment process. The Mail and Telegraph both carried the comments of Peverley. True- they’re both right wing newspapers and tools of Tory propaganda. Yet, the pitch and severity of both pieces in framing Peverley’s comments was a clear abuse of the facts and issues facing disabled people; as are Peverly’s inflammatory comments. The Telegraph carried the headline: ‘A GP incensed at his surgeries being full of the “disgruntled unworking well” has said he considered displaying a poster of Professor Stephen Hawking along with the caption: “This bloke is not on the sick”’. While the Mail went that bit further with the more loaded headline: ‘THIS bloke is not on the sick! Angry GP cites Hawking to shame hordes of patients asking him to sign them off’. Peverley’s original Pulse piece fits the welfare ‘reform’ agenda perfectly. An agenda that incorporates the right wing media and Governments constant demonising of disabled people as feckless/workshy/scroungers – Peverley’s original rallying cry in the Pulse was that he did not want to sign ‘sick notes. The piece headlined: ‘Save me from the unworking well’ was posted on the 29th July. Neither the Mail nor the Telegraph showed the same eagerness to publish his jaunty column of 25th April ‘A Curious Case of Missing Sick Notes’ which talks about the constant losing of sick notes by the DWP. But why would they? Peverley has played into their hands, not only does he appear to support the discredited bio -psychosocial model, beloved of Aylward and Freud, that removes GPs and replaces them with private companies paid with huge amounts of public money- he has given them the final piece of the puzzle –privatise the sick note and remove it from any element of medical evidence. Let’s have 100% ‘fit to work’ even if a 100% drop dead in the process. Those that can afford it, like Hawkings can buy their own private ‘back-up plan’. His surgery address for letters is at the link below-please do not use the surgery telephone lines! at least while it has an entry fee and a cursory nod to inclusion and accessibility. Any attempt at bringing together all those sickened by this Governments shameful and harmful policies to fightback, should include those who have been fighting this fight in the streets, not just in the broadsheets. Those who have led the resistance have earned the right to be part of any movement worthy of the name. And bring about its end. Members attending will not be offered an opportunity to achieve any of these aims. Without grassroots street activists being part of driving this initiative from the outset, any decisions or outcomes are likely to be repeats of tried and tested failures of the past. Without the risk of radical action, the Government is unlikely to be concerned by another march, petition or one day strike. DPAC/Black Triangle members will attend the event in an individual capacity to engage with attendees, and encourage others to join us in our call for sustained mass, widespread civil disobedience from every section of society until this Government falls. As our members and supporters know, Black Triangle has been at the forefront of lobbying members of the medical profession to help us bring an end to the DWP-Atos Work Capability Assessment régime at the earliest possible time. We began locally when our campaign member and Medical Adviser Dr Stephen Carty submitted a motion through the Lothian Local Medical Committee (LMC) to the Scottish Conference of LMCs (Scottish GPs associations) at Clydebank last year. The motion calling for the WCA to end “with immediate effect” was carried almost unanimously. We quickly submitted it to the UK LMCs conference in Liverpool, where it gained the overwhelming support of UK GPs before making its way to the British Medical Association’s Annual Representative Meeting where doctors from every discipline carried it almost unanimously on 24th June. Sadly, as John Pring of Disability News Service has reported, the BMA’s leadership have so far failed to give any meaningful effect to the motion. In November we launched our ESA ‘Substantial Risk’ Regulations 25 and 31 Campaign asking GPs to apply the law to discharge their ethical duty of care to act where policies and systems are causing avoidable harm to patients. Where GPs have done this the campaign has been a great success. We have distributed the information throughout the NHS locally in Scotland and 26 magnificent doctors from Scotland and the rest of the UK at the coalface of have joined with us in lobbying the BMA leadership to disseminate knowledge of the Regulations to GP practices everywhere. The Scottish media has done its bit with coverage in The Scotsman, The Herald and the Edinburgh Evening News. We are deeply grateful to them for this act of socially aware and responsible journalism. However, we have been completely stonewalled by the UK London-based national media such as the BBC and sadly, even by ‘friendly’ publications such as The Guardian who, shocklngly (and not for the first time) do not seem to have found our campaign work meritorious enough to warrant a mention in their esteemed title. As the environmental movement say: ‘Think Globally, Act Locally’. This has been our tactic from the outset and in that spirit we have arranged to meet with the Convenor of the Scottish Parliament’s Welfare Reform Committee, Michael MacMahon MSP, this coming Thursday to present our case to him advocating that the Scottish Parliament now intervene on our behalf in support of our ESA Regulations Campaign. We are confident that our ESA Regulations campaign is fundamentally reasonable in every respect. Further still, we are confident that once it receives the close attention it truly merits, it will prove to be the single most effective weapon we have as a civil and civilised society in fighting back to protect all our sick and/or disabled citizens from the most wicked, unconscionable and ruthless attack on the civil rights of disabled people in living memory. If we in Scotland are successful in enjoining the support and backing of the Scottish Parliament in ensuring that all Scottish GPs know how to apply the regulations, we are confident that GPs in England and Wales will also rapidly follow suit. Wish us luck and when we go there, we go there for you. THE misery that the UK welfare reforms have caused disabled people has been highlighted often by this paper. But that makes the cases cited by doctors today in the Sunday Herald no less shocking. They are proof this system has failed. There is the patient with schizophrenia who believed he was the Messiah, yet was declared fit to work. There is the man who suffered a stroke and had lung cancer but was too scared to go to hospital in case he missed a benefits appointment, fearing he would be at risk of losing his money. There are examples of patients with mental health problems left so distraught at being told they are fit to work they have become suicidal. This is not a system, this is a cruel disgrace. These examples hardly fit with the picture painted by the Westminster government of the “workshy” living it up at the taxpayer’s expense. While Work and Pensions Secretary Iain Duncan Smith preaches of tackling welfare dependency, it is doctors who are witnessing the impact of his “reforms”. This is placing a burden on the NHS – a situation which is expected to get worse as more welfare changes are introduced. Deputy First Minister Nicola Sturgeon and Health Secretary Alex Neil have warned there is an “intolerable strain” on care services and urged Duncan Smith to ensure there is a “fair, equitable” process that gets decisions right first time. This must be introduced to ensure benefit claimants and the NHS do not continue to be the victims of a flawed system. We do not believe that any individual or group who claims to represent the disabled people’s protest movement should engage with DWP/Atos/Capita without insisting upon an end to the Work Capability Assessment (WCA) with immediate effect as a prerequisite to any discussion. We regard any such engagement with DWP/Atos /Capita without this insistence on the above as a prerequisite to be nothing less than collusion in policies and systems that have been irrefutably shown to be harmful and, in many cases, lethal to the sick and/or disabled person being ‘assessed’. The WCA has no empirical, scientific medical evidence-base and the process has never been risk assessed. There remains no feedback or reporting mechanism. The discharge of both a statutory and ethical duty of care – owed by professionals, citizens and public authorities – to others in a vulnerable situation depends upon the existence of a reporting mechanism whereby any potential or actual risk to the life and well-being of a patient or to those around them may be reported and adequately addressed. This is precisely why the entire British medical profession has demanded that WCA end ‘with immediate effect to be replaced by a rigorous and safe system whereby avoidable harm’ may be prevented. That the General Medical Council (GMC) continues to accredit Atos assessment centres with ‘approved medical environment’ status is an utter disgrace. The Work Capability Assessment has caused death, suicide, homelessness, and left people without income dependent on family and friends. The WCA also causes an increase in mental health issues and a worsening of impairments. The latest figures show 73 deaths and suicides per week amongst those subject to this brutal process. The WCA is based on the discredited UNUM manufactured bio-psychosocial model. The Centre for Psychosocial & Disability Research at Cardiff University literature has provided the academic foundation for the increasingly notorious WCA administered by Atos Healthcare in the UK, and without it is unlikely that the WCA would exist in its present form. The volume of incriminating evidence against the WCA has grown phenomenally, as people with serious, incapacitating illnesses continue to be found ‘fit for work’. When Freud set out his vision of welfare reform for disabled people he used a number of references to back up the plans for reforms. No less than 170 of these references came from a group of academics based at or connected to the Cardiff University Department:. This centre originally led by ex Chief medical Officer at the Department for Work and Pensions Sir Mansel Alyward was funded by Unum to the tune of 1.6 million pounds from 2004 to 2009 to add academic credibility to the bio-psychosocial model: a model used by Atos to identify that if someone can press a button they are ‘fit for work’ and ineligible for any disability support. The connection between the WCA and the Cardiff Centre are only too obvious. The latter seeks to locate the source of incapacity in the individual’s psyche/attitude, promoting a form of ‘positive thinking’ as being curative, while the WCA claims to focus on what sick/disabled people can do as an argument that they have even the merest work capacity. But there is a more important connection. The Centre’s funder, Unum Insurance, employed tactics of ‘disability denial’ in the U.S. to avoid paying out on legitimate health claims. And since founding the CPDR Unum have sought to promote their ‘Income Protection’ product, marketing it upon the fact that the British public can no longer rely upon the state to support them if they become sick or disabled. Are we really to believe this is a coincidence? 1. We reject all ideas that ‘tinkering’ with WCA descriptors will serve any positive purpose. We call for the complete removal of the WCA with immediate effect and we have remained unwavering and constant on that position. 2. We reject the bio-psychosocial model as having any purpose but to cut state support and replace it with private insurance and other company profits. 4. We will work with any group who we believe genuinely opposes the government’s attacks on disabled people. However we are seriously concerned with those organisations who believe that they can work with the government to lessen the effects of these attacks. We believe that there is no alternative to outright opposition to the government if we are to stop the impoverishment and destruction of the lives of millions of disabled people in the UK. We are particularly disturbed that some of the large disability charities seem willing to work with the government effectively giving cover to their attacks on disabled people. We call on all disability charities and other groups to immediately withdraw from any work that lends credibility to the government’s so called welfare reforms. 5. We do not support in any shape or form what this government is doing to disabled people: we classify disabled people as those who have to endure the negative attitudes of others, and those disabled by the ways this so called society treats us as less deserving than non-disabled people. We support an assessment that truely establishes a person’s ability to assess their capability to work, not based on a tick box approach. Both DPAC and Black Triangle have the largest supporter base of any grass root groups of disabled people and have worked tirelessely to raise the issues that this government have been responsible for – we have also made it clear that we support union actions and have supported these through tireless promotion and speakers at major and local union events . We were therefore dissapointed and surprised at not to being asked to speak at the TUC Rally on the critical issues that face disabled people. However, we understand how difficult it is to organise such an event so assume this may be an oversight. We look forward to hearing from you on this issue. Invisible Invincible from BelleRose Films on Vimeo. A protest group which occupied a government building said that disabled people were being labelled as “scroungers” during the cuts to public services. The 16-strong group entered the public advice centre at an HM Revenue and Customs building in Glasgow and held up placards, shouting “No to the rich”. Protesters gathered in George Square in the city centre before walking to the HMRC offices in Cochrane Street. “Disabled people are really suffering under this government. The disability allowance has been abolished. “There are also all of these stories calling us scroungers. We are being used as scapegoats. “The big corporations and the really wealthy are not paying their fair portion in taxes. Mr Lockhart has been using a wheelchair since a car accident ten years ago. Around four people also stood outside the entrance to the building. Protesters ended their occupation after around 40 minutes when police arrived and spoke with them. “Disabled people have been used as scapegoats in the mass media and labelled as workshy and scroungers. That is based on no empirical facts. “We believe that these cuts are ideological. We reject the false narrative of there is no alternative. Mr McArdle said the cuts breach the human rights of disabled people under the United Nations’ Convention on the Rights of Persons with Disabilities. “We are protesting about a £120bn tax gap owed by corporations and private individuals. Posted by admin3 at 14:36	Tagged with: Black Triangle, Glasgow, John McArdle, Peter Lockhart, United Nations' Convention on the Rights of Persons with Disabilities. Over a period of 2 1/2 hours on Monday 6th June around 50 people joined the picket, called by the Crutch Collective and Black Triangle, of the Atos Recruitment Evening in Glasgow. Some had travelled from Edinburgh and as far away as Berwick. Some officials of the PCS union were able to attend at the start and took away some leaflets. The admin. staff at Atos are members of PCS. The police were present from early on and stopped people from blocking the doors. With a couple of exceptions most of the 20 or so doctors and nurses going into the Recruitment Evening ignored the request not to take jobs with Atos. This was despite being told of the people with cancer and terminal illnesses having their benefits cut by Atos and the suicides caused by the stress of the relentless and constant reassessment by Atos. They were also given leaflets detailing the fatal consequences of benefit changes as documented by several mental health charities. The leaflet also quoted a former Atos employee in Scotland who quit, because the medical assessments are designed to catch out disabled people. A nurse heckled those inside through a megaphone. The leaflet was read out through the megaphone to the doctors and nurses waiting in the lobby and at the presentation. John McArdle of Black Triangle spoke to the crowd of the need to keep the campaign going until the medical assessments are carried out by a public body again. Plans were made for the next demo. A representative from Citizens United, another direct action orientated anti-cuts group in Glasgow expressed their desire to work with us in the future. We got a clearer idea of the future some of us face as we chatted to some homeless people waiting for the Salvation Army food van who had also had their disability benefits cut despite having serious physical and mental health problems. A handful of the doctors and nurses who attended the Recruitment Evening were escorted by the police through the crowd when they left by the main entrance. Debates were held about whether we should call them scabs or not. The rest had to sneak out via the staff exit like rats. No one was arrested and we were able to make our presence felt for the whole of the event. We are getting substantially bigger. We see the picket as a victory. Atos now know that any future recruitment evenings will need extra security and the presence of the police. The doctors and nurses who chose to forget their medical ethics and any social conscience had to endure the most unpleasant environment possible. The myth of the Atos PR about the ease and convenience of the Atos professional employee lifestyle has been destroyed. Thanks again to everyone who attended and helped promote the picket. I was invited by Women Against the Cuts to join their demo on International Women’s Day to speak about disabled women and the cuts for DPAC. The event was at Trafalagar Square. There was a good number of women already there and I was happy to spot my good friend Sabrina Qureshi from Million Women Rise – a great event with a march of about +5000 from Hyde Park to Trafalgar Sq last Saturday. Zita Holbourne was there speaking for Black Activists Against Cuts and she did a poem too, and Pragna Patel from Southall Black Sisters. I was happy to see Sasha Callaghan from Black Triangle in the crowd and I asked her to speak alongside me for disabled women. I did not realise we were videoed but HarpyMarx posted videos of us in her blog. Thank you! For a transcript of my speech. The Black Triangle campaign has been set up to help defend ALL disabled people from the constant media and government portrayal of disabled people as “scroungers” and thieves for claiming benefits that they are not entitled to. This despite the fact that benefit fraud for those claiming Disability Living Allowance one of the main benefits that can keep disabled people independent and in work is currently only 1%. The wide spread lie that a huge amount of those currently claiming health related benefits are frauds, combined with the pretty badly discredited assessment criteria that see the majority of claimants fail despite having high levels of care and support needs cannot be anything other than an attempt to put disability rights back to a time where most people with disabilities were kept hidden away from society. Despite having the legal right enshrined by European law and United Nation convention, individuals with disabilities will have no access to homes, jobs public transport, family life, or dignity. 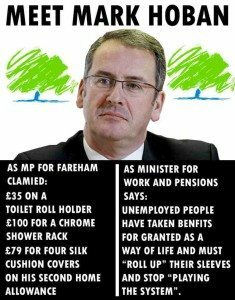 Why will all these be lost, because they need resources, and this Con-Dem government seem to be saying that the British people “can’t pay won’t pay”. Blaming the economic crises on the disabled by constantly saying how high the welfare bill is, or how much extra services like “Access to Work” or “The Independent Living fund” cost so they are closed down to save money, is basically untrue and at odds with the much trumpeted “fairness” agenda the government constantly talk about. The Black Triangle campaign is a small group of local activists who have already been active in direct action protests. We held protest actions, taken part in public forums, joined with the TUC, and STUC in joint action. We have organised FREE accessible transport to the STUC “Better way campaign” rally in Perth this coming Saturday. We will also be working with the organisers of the huge national rally in London on the 26th of March to provide FREE accessible transport. All we need is people to use this transport, we need anyone who wants to go, even if all you want to do is show that you think disabled people deserve respect, then please come. Use the transport and show the government that you are a human being and deserve to be given the courtesy of being treated like one. Go to the page that the Link below leads to and register, or go to Face Book and search for BLACK TRIANGLE. Or email me your interest in attending and I will pass your details on. Take the time to look at the main Black Triangle pages and see if any of the messages or posts give you a sense of what the campaign is all about. If you can please just register with the page, we are only asking for your support not your money. Lastly please will you all have a careful think about all the people that you know. Work, family, neighbours, friends whatever, who ever, please think if this information could be of interest or use to anyone else. Let them know and give them the opportunity to make up their own minds if they wish to be involved or not.